Home > Construction Training Manuals > Construction Mechanic Basic Volume 2 > Figure 7-7.Wheel Cylinder Configurations. Figure 7-8. 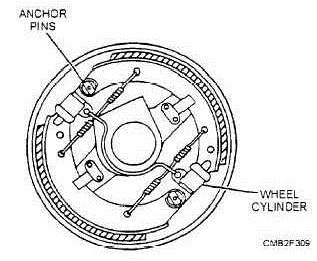 - Double-anchor, double-wheel cylinder configuration. used where a flexing action is required. For example, a brake hose is used between the frame and the front-wheel cylinders or disc brake calipers. This design allows the wheels to move up and down, as well as side to side without damaging the brake line. Figure 7-9 shows the details of how brake lines and brake hoses fit together. A junction block is used where a single brake line must feed two wheel cylindersorcalipers. It is a simply a hollow fittingwith one inlet and two or more outlets. Mounting brackets and clips are used to secure brake lines and hoses to the unibody or frame of the vehicle. The mounting brackets help hold the assemblies secure and reduce the vibration which causes metal fatigue, thereby preventing line breakage. Figure 7-7. 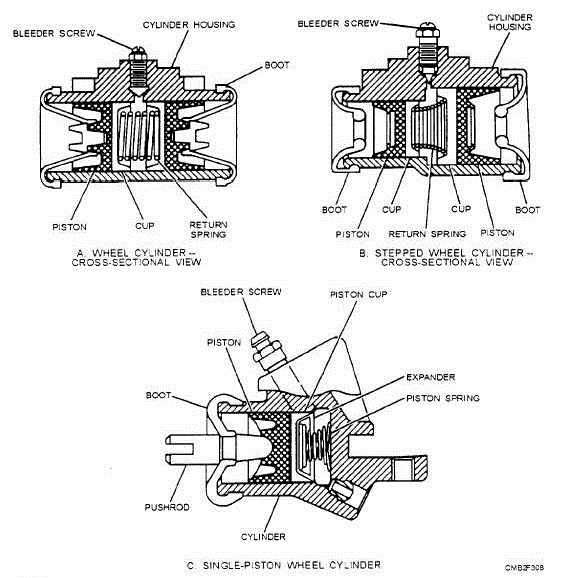 - Wheel cylinder configurations.